When I flung the book open to the right page I saw the evidence that I had made this one before. I have zero memory of doing it. But there are my pencilled in gram weights against the home column. When I first started baking from this book I weighed the home column out in ounces and then clicked over to the gram reading and wrote them down directly in the book. Later on I figured that one could far more easily divide the middle column by 10 and get pretty much the same numbers, so my inner Sherlock tells me that I must have made this bread before the blog. Did I like it then? Again no notes. This is why it is good to write a blog. At least you can stare at the pictures a year or two later and try and trigger your memory. There was nothing for it but to make it again. I mixed up the liquid levain, left it overnight. Mixed up a little bowl of crushed rye grain, (sourced at the Swedish Shop in London where it is sold under the name of Rågkross) rolled oats, golden linseed and sunflower seeds with boiling water and curiously a pinch of salt – and left that overnight to absorb the water. 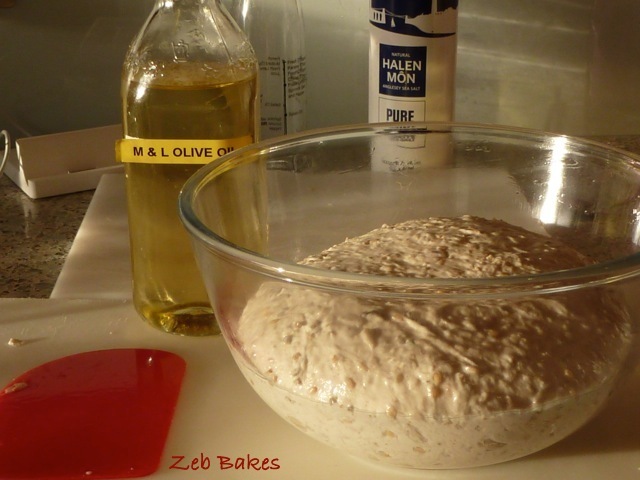 In the morning I mixed up a dough with very strong (high gluten flour) and a bit of the old Swiss Dark. 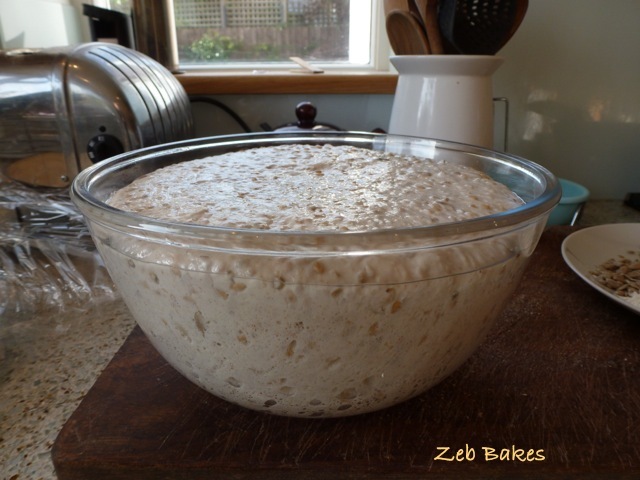 I held back on some of the water as it all looked very wet and indeed JH warns you that this is a water-full dough in the text and advises you to bake it well and long. So I threw it out onto a board with a large wet splat – then the phone rang – and I chatted away, while poking it with one hand to stop it sliding onto the floor. 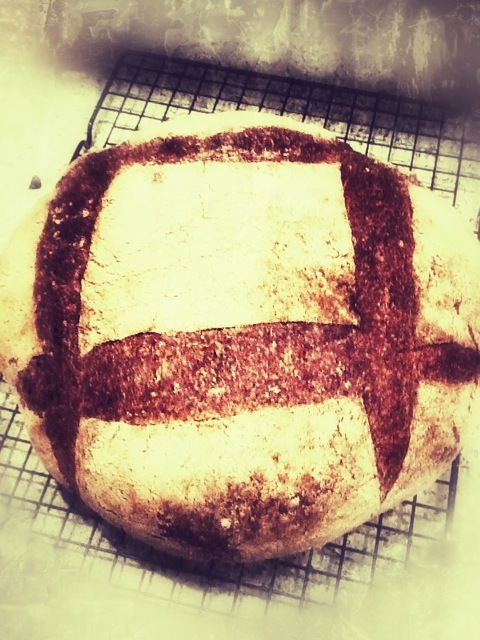 Eventually I shaped it into a large floppy boule that wouldn’t hold its shape. Then I changed my mind and tipped it out onto the bench (more flour everywhere) and finally wrangled it into six little rolls and a loaf instead. Messing around with the dough doesn’t do it any good, I know that, but that’s what happened. 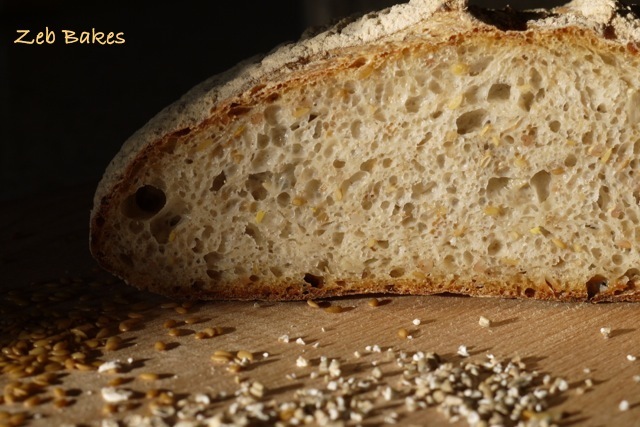 The bread has good flavour and I like the combination of grains, but it is supposed to be light and airy according to Jeffrey Hamelman and you can see that the crumb is fairly close and dense. That is down to my handling. In my defence it was a very sticky, gooey sort of dough, but again that was my mistake for letting it get too warm in the ‘proving’ oven. Cooler doughs are a lot easier to handle than warm ones. You’d think maybe I would know all this? Well I do know it, but every so often I just ignore what I know and do something fairly senseless. It’s lucky I don’t do this for a living, that’s what I say. If you are despairing of your slashing, try using a pair of scissors instead, hold them at a shallow angle and cut little V’s into the dough and with any luck you will get a very nice hedgehog effect on your loaf. 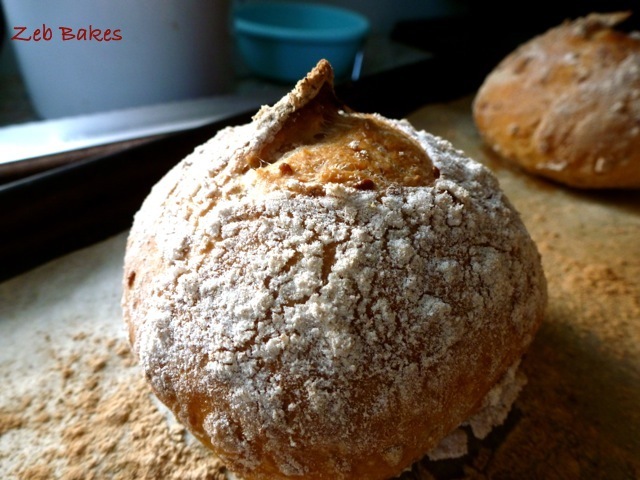 This entry was posted in Bread, Mellow Bakers and tagged baking, Bread, five grain levain, Jeffrey Hamelman, Mellow Bakers, scissor top, slashing on 21/01/2012 by Joanna. and then the Mellow Bakers will have baked their way through the entire oeuvre. Well, some brilliant bakers have done it, I didn’t quite manage it, but so it goes. I’m going to have a serious crack at getting these done though as they all look like great recipes. The pics at the top are nothing to do with these breads as I haven’t made them yet but what is a bread post without pictures? So if you’re wondering what to bake this month, we’d love you to join in with this final set of breads, dig out some garlic from your stores and make roast garlic yumminess, you can use it in other dishes too, and post about it on your blog, or tweet a photo, or send me a link or post about it here on the Mellow Bakers forum. It’s never too late to be Mellow about your baking. Due to the old banner being a different size to the new one it has vanished from the Mellow Bakers Pages which is sad but here it is for those of you who haven’t seen it. 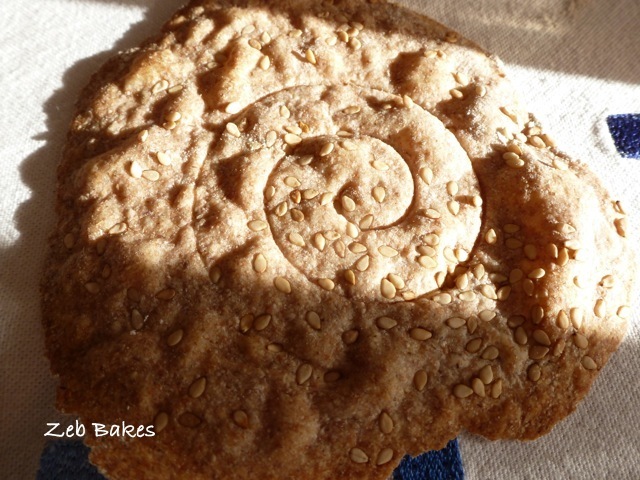 This entry was posted in Bread, Mellow Bakers and tagged baking, Bread, five grain, January breads, Jeffrey Hamelman, last month, Mellow Bakers, roasted garlic, semolina on 04/01/2012 by Joanna. 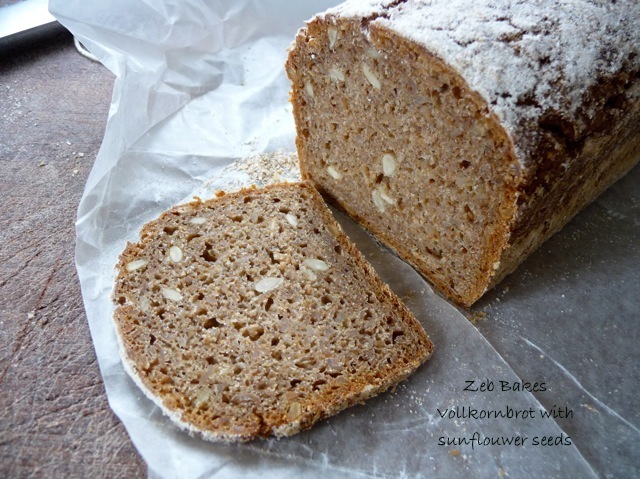 I recently made the Sunflower Bread with Paté Fermentée from Jeffrey Hamelman’s book Bread as I have got a bit behind lately with Mellow Bakers, the group that is slowly but surely doing its best to bake all the recipes in the book. 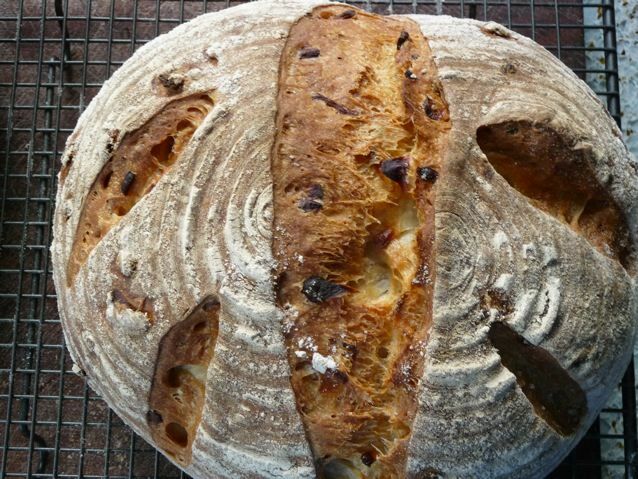 This is one of those breads that is full of grains, so if you are a seedy person then it’s another variation to try. I am not quite sure why this one came out so flat in profile. 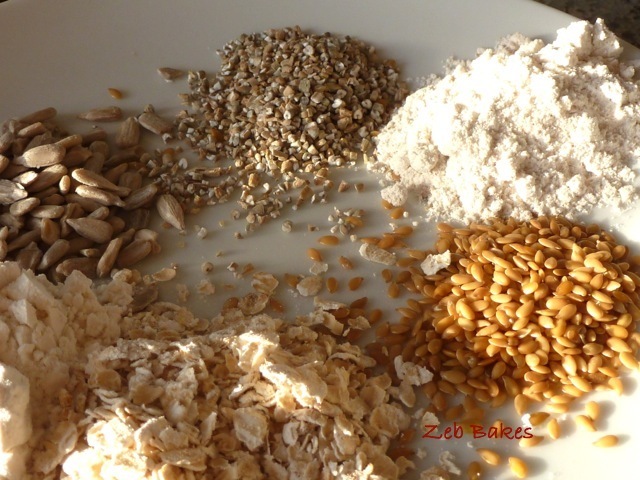 When I sliced into it it was reasonably aerated and I don’t think it was overproved, but it didn’t do much in the way of rising at any point so I think it was the load of grains, soaked chopped rye, sunflower seeds and some linseed that I added as I was short on sunflower seeds. So far it’s been fine, but maybe this bread could have done with ten per cent very strong flour in the mix to give it a bit more lift. 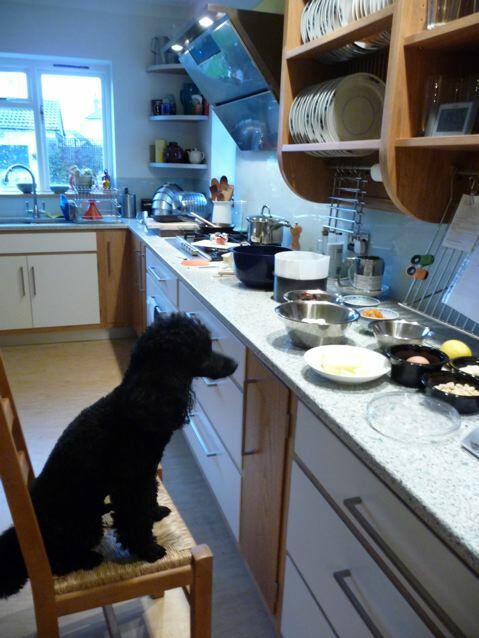 I was using Shipton No 1 for the flour in this one. Who knows? I’ll have to check out what the others made of this one when I post the link over on the Mellow Bakers forum. 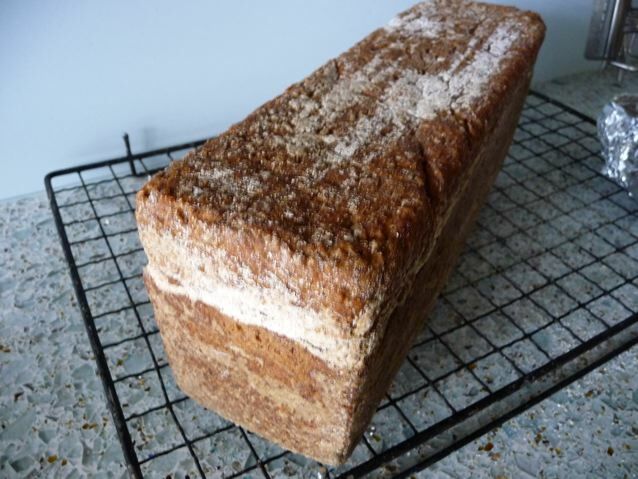 It’s been a while since I made a seeded loaf and I think there are other recipes which are less faff than this one and give you a similar if not better result than this one. I also bake these breads at a lower temperature than Hamelman gives, simply because I don’t like these grainy breads to have very hard crusts. Any grains that are in the crust area then get super hard and are not pleasant to eat unless you have the teeth of a rodent. More people crack teeth on hard grains in bread than anything else according to my dentist. The trademarked ‘Granary’ in the UK being the worst culprit for this or so she says, not my words, hers! I am not convinced that just soaking the chopped rye (which forms a hefty component of this dough) in cold water for four hours softens them enough either. Another time I would use warm water or gently simmer them to make sure they soften up and maybe soak them overnight in some fruit juice or ale as Dan Lepard does to great effect in his grain breads in the Handmade Loaf. All the same this made a moist and tasty seedy loaf that improved in flavour and texture on the second day and was lovely with a rasher of middle cut bacon. The sun came out for this shot! Just a footnote: I wrote a couple of posts about this book (which is my second most useful bread book) a while back and I also came across this thread on the Fresh Loaf, which might also be of interest. It seems to imply that the most recent edition has had all the errors corrected. However, the only way to be sure that you get the most recent edition is to check the printing number at the front, and if you are ordering from an online supplier, they may well have old stock. 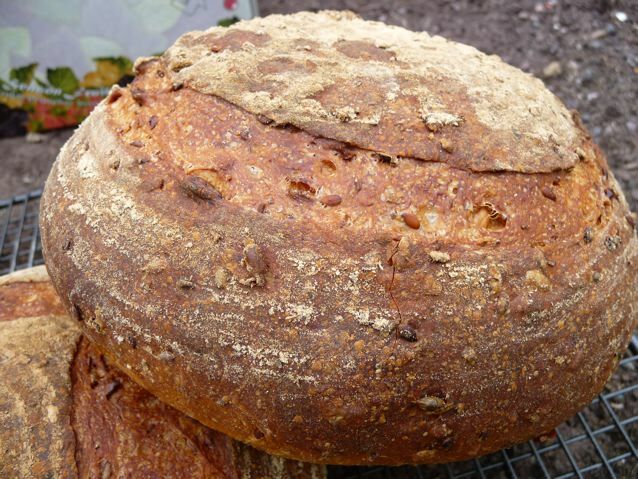 Patée Fermentée – For some reason this bread made with five different grains came out gloriously – so have a peek at that one if you want to see seedy loveliness! This entry was posted in Blogging, Bread, Mellow Bakers and tagged baking, Food, Mellow Bakers, paté fermentée, Sunflower seed bread on 25/10/2011 by Joanna. This is Part 2 of a 2 part post. Part 1 is here. It refers to the 2004 Edition of Bread, not to the new Edition. This entry was posted in Blogging, Books, Bread, Mellow Bakers and tagged Baguettes with Poolish, Bread, Jeffrey Hamelman, Review on 06/09/2011 by Joanna.